Students flipping to the very last page of their essays to see the grade rather than the comments. Parents emailing about their students’ scores rather than their growth. Government initiatives focusing on test scores and test scores only. Do any of these situations sound familiar? For many teachers and principals across America, the emphasis on grades in education is irritating at best and damaging at worst. Have students always been obsessed with grades? Why? Is there anything educators can do about it? While the answers to the questions “Why?” and “What now?” are more complicated, the answer to the first question is easy: no, students have not always fixated on grades. According to researchers Jeffrey Schinske and Kimberly Tanner, grades are actually a fairly recent phenomenon, dating only to around the 1940s. Prior to grades existing as we know them today, Harvard and other 18th and 19th-century universities relied on medals and class ranks to communicate how much knowledge a particular student gained while in school. Interestingly enough, the primary reason grades did begin to develop in the 19th and 20th centuries was to ease communication between institutions. As more colleges were founded and those that existed grew larger, schools and teachers needed a way to communicate student readiness and accomplishment. Before the current A through F scale became ubiquitous, most teachers used a 100-point scale to evaluate their students. However, if you’ve read our article on rubrics, you may not be surprised to hear that a scale with so many gradations was not very reliable, and researchers at the time advocated switching to a 5-point scale (A, B, C, D, F) to normalize scores between teachers. As Schinske and Tanner emphasize, neither the development of a grading system nor the subsequent revisions of that system were done for the benefit of student learning per se; historically, grades have existed primarily for institutions. If grades were not created with students in mind, why do students care so much about them? While it is tempting to blame teenage hormones or social media or any of the other usual scapegoats, students are ultimately responding to the structure of our education system. Every grade counts toward the student’s overall GPA, and GPAs matter for internships, college admissions, and job applications. In fact, some employers don’t even consider applicants who have lower than a certain GPA, and some Texas colleges automatically admit students who are in the top 10% of their high school class, a status usually determined by GPA. Like it or not, a student with a 2.5 GPA who retains everything from their classes is less likely to get into Yale than a student with a 4.0 who throws away all their papers the minute high school ends. Because so much depends upon high school grades, parents end up caring about them a lot too, which only increases the stakes for students. Many parents, particularly in high-achieving, high-pressure schools, go directly to teachers to try to get their children’s grades raised, and one 2014 survey found that 80% of kids thought that their parents cared more about their achievement than their happiness or altruism. Some school districts have even had to restrict the number of times per week that parents are allowed to access their children’s grades online. Perhaps because their parents value good grades so highly, many students use their grades as a barometer of their intelligence. As Inside Higher Ed explains, students often focus on “the gap between their outcomes, in the form of grades, and their input, in the form of effort.” A student with high outcomes and low input is assumed to be more intelligent, hence students bragging about not studying for quizzes or the SAT. Even when they don’t try to minimize their academic effort, many students base their sense of self on academic achievement, often in the form of grades. A 2002 psychology study found that over 80% of college freshmen based their self-worth on academic competence—more than family support, appearance, or any other single factor. This finding is worrying because basing self-worth on external sources is correlated with “more stress, anger, academic problems, [and] relationship conflicts” as well as “drug and alcohol use and symptoms of eating disorders.” In light of this information, it’s no wonder students act like getting a poor score on an essay is a personal attack—to them, it is. However, the problems with students’ focus on grades don’t end with self-esteem. Fixating on grades is part of a larger issue: the source for academic motivation. Intrinsic motivation, sometimes called inward motivational orientation, is motivation that is “self-[centered] in a positive way,” in that someone’s own “desire to learn from the task has the highest priority.” Extrinsic motivation, on the other hand, relies entirely on the outside world for incentives, such as praise and grades, to learn. Put in simpler terms, a student’s level of intrinsic or extrinsic motivation is often stable over their lifetime; developing an intrinsic motivation at an early age is a good predictor of lifelong learning as well as overall wellbeing. Taken together, all of these studies, surveys, and theories are striking. 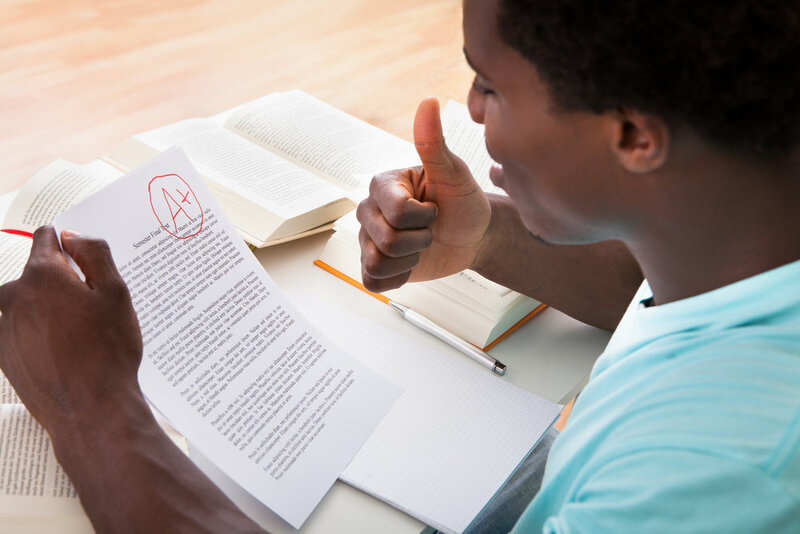 When students obsess about grades, it is not just annoying for teachers or unideal for students; it hurts their mental and physical health, limits their ability to think broadly and originally, and affects their motivation for learning and working. Since so much of identity formation happens during K-12 schooling, how students learn to interpret their grades in relation to themselves really matters-- both in the moment and over the years. In addition to concerns about whether students’ focus on grades is healthy for them emotionally, there is also evidence that grades can have a negative effect on academic progress. Most student evaluations are composed of both evaluative feedback, which “judges student work,” and descriptive feedback, “which provides information about how a student can become more competent.” Many studies have found that while students focus heavily on evaluative feedback, descriptive feedback is much more important for student learning. For example, one study divided students into three groups: some students got descriptive feedback, some got evaluative feedback (grades), and the rest got no feedback. The result? “Providing evaluative feedback (in this case, grades) after a task does not appear to enhance students’ future performance in problem-solving.” Students who received descriptive feedback, on the other hand, performed significantly better on all subsequent tasks than students in the other two groups. In fact, evaluative feedback not only doesn’t help students perform better in the future, it often distracts students from absorbing important descriptive feedback in the present. These effects are amplified in low achievers who experience “dramatic declines” in academic interest upon receiving low scores. In contrast, there have been no measured negative consequences of receiving descriptive feedback alone. These results have been replicated across studies, regions, and decades. Although there are many theories as to why grades produce such a negative effect on students, one of the most convincing ideas is feedback intervention theory, which describes how receiving feedback leads to changes in attention. Ideally, feedback should focus students’ attention on the task at hand and the learning required to perform the task more effectively; because of the aforementioned research about self-esteem and academic achievement, grades focus students’ attention on themselves instead, leading to worse academic performances. Although some of the focus on grades comes from pressures outside the classroom, there are many methods that teachers can use to encourage students to reorient their attention to learning itself. For example, one teacher suggests giving “evolving assignments,” such as papers written in installments with descriptive feedback but no grades until the end. This kind of assignment shows that learning is never finished, and work can always be improved. Such projects will also help prepare students for the outside world in which they might have year-long engineering projects or book deals with dozens of drafts. Other possible activities include learning reflections that encourage students to link current assignments to the skills that they will need for their future desired jobs. For example, if one student is interested in becoming a biology researcher, they might reflect on how their in-class presentation on To Kill a Mockingbird will make them more comfortable communicating their scientific findings to a lay audience in the future. This idea is more externally oriented than it could be, but the focus is off of grades and onto the benefits that skills-based knowledge can yield. Lastly, teachers can help to prioritize learning by making small shifts in their diction when giving any kind of assignment. Rather than saying, “this is what I need you to do,” teachers can say, “This is what this assignment will teach you.” After all, learning is about what the students gain, not what the teachers want. As seen earlier, intrinsic motivation is a major factor in educational success, and although some students may be naturally more inclined to have one type of motivation or the other, teachers can have a big role in increasing intrinsic motivation in all their students. Vanderbilt’s Center for Teaching suggests that intrinsic motivation is facilitated by two factors: interest and control. That is, the material has to hold the students’ interest and the students must feel that they can exert control over the learning process. To increase interest, teachers should display passion about the subject matter themselves; dry presentations can discourage even the most motivated of students and compelling ones can draw in even the most apathetic. There are a number of different cues that can help teachers express interest; Vanderbilt recommends using cues such as novelty (ex: “This is different than anything we’ve learned so far!”), surprise (“Just wait for the chapter we are going to read tomorrow!”), and challenges (“Who’s ready to be pushed to the next level?”) to increase interest in subject matter. To increase students’ control over their own learning, teachers can also employ student-led teaching activities, help students set their own performance goals, and allow students to choose their own paper and presentation topics. Naturally, some of the ways to push the emphasis back on learning involve changing the ways we grade and think about grading. ﻿Despite the research that calls for grades to be abolished altogether, very few schools exist that do so, and the reasons why grades were developed in the 19th century remain relevant. One way to keep grading while shifting the emphasis onto learning is to grade based on participation and effort. This system has been shown to increase students’ interest in academic improvement. Some researchers also argue that students will become more self-regulated and self-motivated learners if they have more control over the grading process. For example, you can provide students with clear rubrics that explain the criteria for each assignment and even ask students to use rubrics to assess their own work (here's more on constructing effective rubrics). In addition, many studies call the validity of grades into question because they are often influenced by teacher bias. Using The Graide Network to implement anonymous grading would solve this problem by removing potential biases such as race, gender, class, and teacher preference. Many researchers also suggest that “the time and energy spent on grading has often been pinpointed as a key barrier to instructors becoming more innovative in their teaching.” The Graide Network helps teachers to hurdle that barrier, as teachers who partner with us have more time to restructure courses, refine pedagogical choices, create engaging lectures, and brainstorm ways to focus student attention on the learning process. Lastly, research suggests that one of the best ways to improve student success is to provide more descriptive feedback rather than more numerical evaluations. The Graide Network’s future educators are trained to do exactly that; we provide students with actionable, specific, goal-oriented feedback that keeps them focused on learning and encourages them to grow as intellectuals. Despite the flaws with grading, grades are here to stay. Prestigious colleges expect them for admissions and scholarship opportunities, and employers view grades as a measure of hard work and technical skill. Good grades are even linked to higher lifetime earning potential. All that said, as student stress levels rise and employers prioritize skills and experience over GPA, it is important that grades do not eclipse learning as the end goal of education. By providing our students with high-quality, constructive feedback, we can help them become learners with a passion for knowledge that will serve them all their lives.